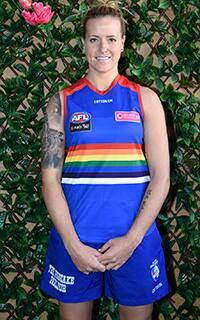 Pride Guernsey Revealed BulldogsTV showcases the new pride guernsey that will be worn during the Pride Game, AFLW round 4 against Carlton. The Western Bulldogs have unveiled the specially-designed guernsey which the club’s AFLW players will wear in the inaugural women’s Pride Game in Round 4. The Bulldogs will host Carlton in the first ever AFLW Pride Game at VU Whitten Oval on Friday, February 23. BUY NOW | Purchase the Bulldogs' Pride Guernsey now at the Bulldogs Shop online. The famous hoops of the club’s guernsey have been transformed into the colours of the rainbow flag – a symbol synonymous with the LGBTIQ community. The Pride Game was established to celebrate inclusiveness, gender diversity, and welcoming all people, no matter their sexual orientation. Along with the Pride Guernsey, the club has also released a range of merchandise for the Pride Game, including scarves, flags and mugs, which are available at the Bulldog Shop. The Bulldogs’ AFLW team has won its opening two games of the season and faces reigning premier Adelaide this weekend, before the clash with Carlton under lights at VU Whitten Oval.